Brackley were unable to close the gap on third-placed Bourne in Midlands Four East South. 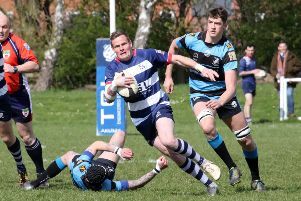 Bourne ran out 23-10 winners in a thrilling game in which Brackley played their part only to return home empty-handed. Almost perfect conditions greeted fourth-placed Brackley who travelled with a good squad albeit a couple of enforced late changes. The game was full of flair and running rugby as both sides set out to attack, so much so, the first scrum only took place more than 25 minutes into the first half. That was a credit to both teams especially as they looked to move the ball around at pace. Brackley opened the scoring with a Mike Lowdell penalty, great control in the opening five minutes. Their first entry into the Bourne 22 saw them come away with three points. Bourne struck next and kicked a penalty to level matters. The home side had the majority of possession and were rewarded with a couple of tries out wide in the first half to lead 18-3 at halftime. Brackley came out in the second half firing on all cylinders. Resorting back to the pack to gain some dominance, a pick-and-go resulted in Luke Hallam Evans crashing over and Lowdell adding the extras. That led to a tight affair in the second half with both sides having their chances to build a lead. But with 15 minutes to go Bourne crossed the line to end Brackley’s hopes of getting something from the game.